Sales of new homes rose in November while the backlog of unsold homes fell for a fourth straight month, providing hope that the serious slump in housing could be ending. Sales of new single-family homes rose by 3.4 percent last month to a seasonally adjusted annual rate of 1.047 million units, reflecting solid sales increases in every region of the country except the South. The increase was better than had been expected and offered hope that the steep slide in housing may be starting to bottom out as builders, using a wide array of incentives, begin to make a dent in the record level of unsold homes. The 3.4 percent rebound in sales last month was the third increase in the past four months. It helped to lift the median price for a new home to $251,700, an increase of 3.2 percent from a year ago. The median price is the point where half the homes sold for more and half for less. However, prices of existing single-family homes across the nation rose in October at the slowest rate in almost a decade, a housing index released Tuesday by Standard & Poor's showed, giving more evidence of the housing market's deceleration, which has affected many parts of the broader economy. The S&P/Case-Shiller composite index showed a 2.4 percent year-over-year increase in the price of a single-family home based on prices of existing homes tracked over time in 10 metropolitan markets. For its 20-city composite index, prices grew 2.9 percent, the slowest rate ever for that data, according to the S&P index committee chairman, David Blitzer. "Home price gains are continuing their steep deceleration," said chief economist Robert Shiller of MacroMarkets LLC. "We can clearly see that the monthly price declines are wide spread nationally." The growth rate of the 10-city composite index is sharply below the 3.7 percent rise posted in September and the slowest since a 2 percent growth rate in February 1997, according to S&P. In addition to the overall composite index, the housing indicator also measures the health of existing home sales in 20 major markets in the U.S. The S&P added 10 additional markets this month. Among the worst performing markets were Detroit, Boston, Cleveland, San Diego and San Francisco. Seattle and Portland, meanwhile, posted strong annual returns. The housing industry has undergone a severe slowdown this year following a prolonged boom that had been fueled by the lowest mortgage rates in more than four decades. 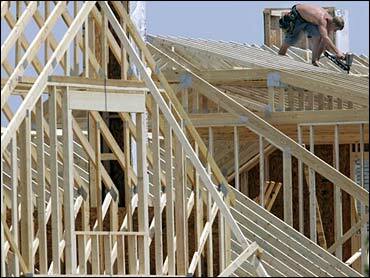 This year's slump followed five years in which sales of both new and existing homes had set records. What some are calling a recession in housing has been a big factor in the economy's overall slowdown, cutting 1.2 percentage points from growth in the July-September quarter, a period when the economy expanded at a lackluster pace of just 2 percent. Many analysts believe housing is continuing to act as a drag on growth in the current quarter and will continue to depress activity through the early part of 2007. The number of unsold homes fell by 1.4 percent in November to 545,000. It was the fourth straight decline in inventories after they had hit an all-time high of 573,000 units in July. Builders have been cutting prices and offering various incentives such as helping to cover closing costs in an effort to move finished homes and reduce high cancellation rates. It would take 6.3 months to exhaust the current supply of homes at the November sales pace, down from 6.7 months in October and 7.2 months in July. Sales last month increased in all parts of the country except the South, where they fell by 9.3 percent. Sales were up 22.5 percent in the Northeast, a rebound from a huge 35.5 percent drop in October. Sales rose by 22.4 percent in the Midwest and 19 percent in the West.